As I explained in an earlier post, my daughter has outgrown books like these. Her latest read is a vampire story (reading level 2.5) but she did grab this for "Sharing" (show and tell), which her religion class does on Friday. They have to bring religious things to share. 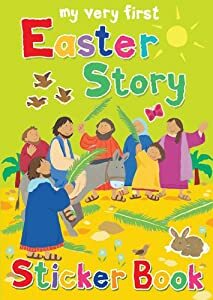 If you have a young reader or a reluctant reader, or even a non-reader, this is a good introduction to the Biblical story of Easter. The stickers give the kids a concrete way to interact with the story, which is bright, colorful and easy to read. Grade: B.
I'd like to thank the publisher for making a review copy available. I was not obligated to write a positive review. Hi RAnn, who did you review this book for? I am curious because the companies I review for rarely have good options for young children and that's the genre I'm most interested in. Thanks and God bless!